The attempt at collaboration between Miles Davis and Jimi Hendrix that never got off the ground before Hendrix died. Dreaming about how cool it would be to have a time machine and transport back to 1959 and see these guys live. Just as no horn player is cooler or sexier than Miles Davis, no actress is cooler or sexier than Jeanne Moreau. Davis already did the soundtrack for her great performance in Elevator to the Gallows. Moreau’s turn as a bored housewife in Louis Malle’s The Lovers could easily substitute Kind of Blue for Brahms. 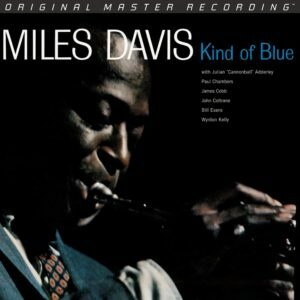 Kind of Blue is the biggest-selling jazz title of all time. Combined with the fact it was very well recorded and remains one of the works that changed the face of jazz, its status has resulted in a record about which everyone harbors an opinion about sound quality. Indeed, there are few casual viewpoints regarding sonics on Kind of Blue reissues—and these opinions can seemingly eclipse those regarding Roe v. Wade when it comes to intensity and conviction. That said, and having taken a deep breath, let’s proceed with a brief peek inside this can of worms. First, the cast of characters. Miles Davis, the hippest character to ever play jazz, whose attitude and style left a very deep imprint on most every pop performer right up to the present day. John Coltrane, the introspective, spiritual tenor player who was about to take off on his own and define avant-garde jazz—and the musician whose influence has registered with greater impact than that of anyone else on future generations of saxophone players. Then there is the legendary lineup of Bill Evans, Cannonball Adderley, Wynton Kelly, Paul Chambers, and Jimmy Cobb filling out the other chairs. The music of Kind of Blue, which progresses by use of musical modes rather than chord changes, was hardly new. It was used quite a bit for a decade before, but Davis imbued it with his subdued horn sound and it blossomed. It remains accessible to anyone—jazz veteran or newbie—without in any way sounding like “smooth” jazz. Original pressings of Kind of Blue possess hints of magic shared by no reissue—a bit of air and sparkle at the top end that may not have survived the aging of the tape. They also have some significant drawbacks. Clean originals fetch several hundred dollars on eBay. One side of the LP is reproduced at an uncorrected wrong tape speed. Much of the music is recorded at a low level. The bass is slightly rolled off and tonal stability, compared to the best reissues, does not fare as well. And, it remains terrifically difficult to find a copy without some surface noise. Mobile Fidelity’s two-record 45RPM set solves all these problems. Chambers’ bass goes deeper and its pitch stability is much greater. Piano sound, sometimes a bit wobbly in pitch on the original, feels more certain. However, the soundstage on the original seems a bit more coherent compared to the Mobile Fidelity, which places the instruments in a more specific location. Whether such specificity results from the original LP filling out the space around the instruments with greater detail, or from the superior pitch stability of the reissue, is debatable. For now, when I want a close listen to Kind of Blue, I’ll leave my original on the shelf and queue up the Mobile Fidelity. The Mobile Fidelity also boasts solid packaging. The two LPs come enclosed in a handsome box containing a booklet with recording and reissue data, several session photographs not included with the original album, and a reproduction of the original liner notes. While not quite as deluxe as that associated with Mobile Fidelity’s UltraDisc One-Step reissues, the box presentation is well-conceived and durable. Some analog fanatics prefer one or another of the Classic Records reissues from several years ago, but those long-out-of-print versions now cost as much as an original pressing. Someday, Mobile Fidelity’s release will go out of print and will also draw silly prices. For now, it’s a bargain.